Pictured above are Alison Mahon, Rotary Club of Sarnia, Janet Shrumm, Rotary Sarnia-Lambton After Hours and Henry Kulik Rotary Club Sarnia-Bluewaterland. A popular gathering area in one of Sarnia’s premier parks is getting a facelift. Shovels are expected in the ground later this year to rebuild accessible playground equipment, and add an open gathering area into the existing, adjacent picnic shelter, said Ryan Chamney, Manager of Recreation and Planning with the City of Sarnia, in an email. 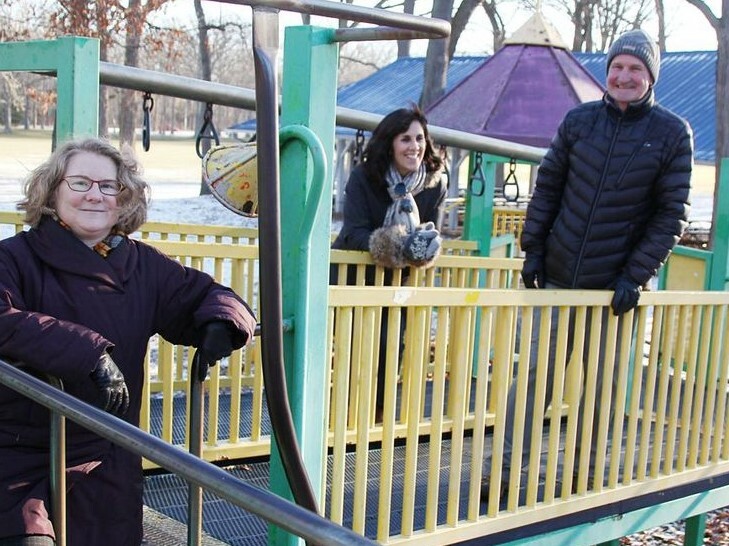 Dubbed the Rotary Accessible Playground and Community Hub, the estimated $250,000 refresh is the big-project payoff after four years of fundraising by Sarnia’s three Rotary clubs – Sarnia-Bluewaterland, Sarnia-Lambton After-Hours, and the Rotary Club of Sarnia. The clubs have supported each other’s initiatives in the past, but “this is probably one of the first times we’ve run a fundraiser jointly,” said Rob Collie, with the Rotary Club of Sarnia, and chairperson of the collective’s Trip of the Month Committee. They’ve netted about $80,000 from four years of selling tickets for the monthly trip giveaway contest, he said. Ticket sales have closed for this year’s. The first draw was happening Friday. The clubs started accumulating the cache four years ago for some sort of big project, but didn’t settle on the Canatara upgrade until the city made its proposal last year, he said. The project was announced in the fall. “It’s the place we felt Rotary could make an impact in the city and have something central and visual,” Collie said, calling it a good fit. Rotary District 6330 clubs contributed to a water project in Cameroon Africa. Funds amounting to $11,600 USD were contributed by Sarnia Bluewaterland, Sarnia, Sarnia-Lambton After Hours, Petrolia, Strathroy and the Watford Rotary clubs. The Watford Rotary club coordinated the Global Grant application with the Rotary Foundation which matched club and district funds to a final total of $38,700 USD. Rotarians from the Kumbo Rotary Club in Cameroon are sharing the success of the project with local media. Wish to be a Guest?